MG’s campaign for the starvation victims in Murshidabad has reinforced our belief that an ocean of goodwill and goodness still exists in our community and country. People are ready to respond to any genuine and sincere call to help suffering mankind. This was last seen during the tsunami and earlier after the Gujarat riots. It is utterly baseless to believe that people have changed with the times, that selfishness has taken roots and people no longer care about others. When we started this campaign, we did not expect this kind overwhelming response. We simply collected some funds from friends and relatives. MG and myself donated what we could at the time and the relief work started then and there. Our representative went straight to the area, made enquiries on the ground and started the relief work of urgent nature. Soon he appointed two locals, both graduates, to do the relief work on full time basis. They are Golam Kibriya and Saiful Islam, both graduates of Jalangi area. Our work at the moment is limited to offering food relief to most affected people (around 70 families - the numbers are rising) at the moment. In addition to this, we are also offering medical help to those in urgent need of attention. Some other help like donating a sewing machine to a vocational centre in Jalangi, cash and kind help to some to start small business like cycle repair or ice cream vending has also been undertaken. The relief work started as soon as our representative arrived in Jalangi on 25 March. We intend to continue this level of relief for another five months. We hope that during this period the authorities will start their part of the long-term rehabilitation work by offering below poverty line (BPL) ration cards to all the victims who have lost their agricultural lands and homes due to erosion by River Padma, appropriate land in lieu of what they have lost, cash help to build their houses, compensation to those who have lost someone in the family due to starvation. In addition to food and medical help we also intend to offer in the coming months help in kind like distributing sewing machines to widows and other destitute women who can use them to earn a living, small cash help to enable people interested in starting some small business. If the authorities dither, we may also think of buying some land in the area and offer it to the victims to use it to build their own houses. The land in the area is cheap (Rs 20,000 per bigha). These poor victims have to pay rent for the private land they have used to build their small jhuggies. A booklet containing all the relevant information including the text of the PIL filed in the Supreme Court of India as well reports from the media, including the Bengali press has been published and sent in large numbers to important people in the country in order to create awareness. This booklet may be bought from The Milli Gazette. All proceeds will go to the Charity Alliance which is handling the relief work. This organisation has been registered with MG editor as chairman in order to do this and similar work in future in an organised and systematic way. The idea is that we should have enough funds at our disposal at any time in order to start such work immediately as well as offer other important help to the community like scholarships and freeships to children who are unable to go to school due to poverty. During the course of this work, we had some very pleasant surprises. It started with Nadim Ahmad who had just started his work as a junior lawyer in Delhi. He previously worked with us before deciding to go back to college to earn his law degree. When I asked him if he could go to Murshidbad, he did not think twice although he had just begun a new career. Within days he was in Jalangi and spent there a full month. He has since returned but will go back again to the area this week in order to follow up and plan the next phase of relief. The next surprise came when our printer, Farid bhai of Nice Printing Press, flatly refused to accept printing charges of the booklet. No amount of persuation could do its trick with him. This was his way of helping the cause. Abu Asim Azmi, a Mumbai-based businessman who is now member of Rajya Sabha, had another surprise in store for me. I had approached him only to seek his help to raise the issue in Parliament. Not only did he promise all possible help, without being asked, Asimbhai told me that he is donating one lakh rupees for the relief in Murshidbad. The next surprise came from Navaid Hamid who wholeheartedly adopted the cause and may soon visit the area himself with some members of Parliament. An even bigger surprise came from the grandchildren of a friend in Downers Grove, Ill., USA. One fine evening he gathered them after Maghrib prayers and asked them about the benefits of prayer and explained to them what it does to persons who pray. He asked them to think of something which helps more in terms of benefit to oneself as well as to others. He asked them what do they do in the morning when they get up. One of them said, “breakfast.” Now he asked, who provides it to you? Parents and Allah, came the reply. He asked them again, if the parents are not there or do not have food, who will then feed them? Allah will feed us, one of them replied. Now he told them about the responsibility of those who have food and can feed others in need. All agreed that they should feed those in need. He then showed the MG news and asked them how would they want to help these starving people, and in what way? The younger one, Sabir (4 years) said, let us send the food through the mailman to them. He offered to donate $5 from his pocket money. The next, Mohammad (7), said he will give $10. 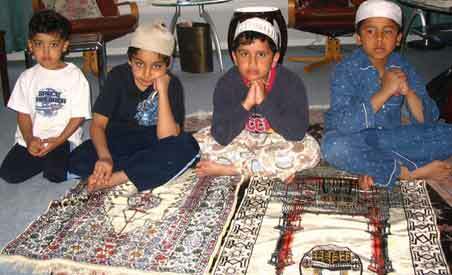 The third, Yusof (8), offered $10 while the oldest one, Bilal (9), offered $20... This story brought to my memory how small children in early Islam used to stand on their toes so that they would be counted as elders and allowed to take part in Jihad. Zara nam ho to yeh mitti badi zarkhez hai saqi.